Snow Before You Go: March comes in like a lion, bringing feet of powder with it. March is coming in like a lion across the West. 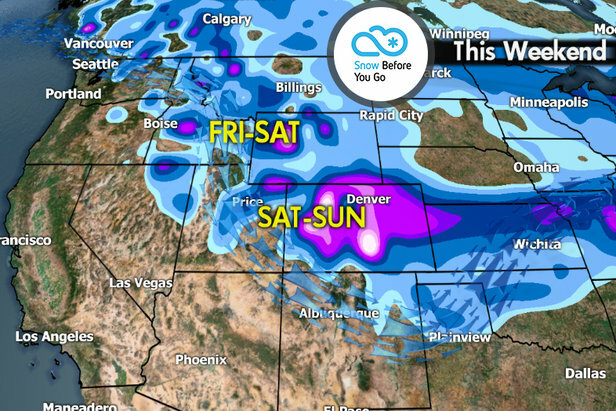 The best new snow this weekend will fall in Colorado, New Mexico, California and Wyoming. A dip in the jet stream (storm track) will usher a large Pacific storm through the Cascades, Lake Tahoe, Nevada and eventually into Colorado and New Mexico. It looks impressive! I'm expecting heavy snow (feet of it) and high avalanche danger in Colorado this weekend. The weekend starts dry and cold in the Northeast before a storm system moves in late Sunday into Monday with new snow for the ski areas. Another storm will follow on its heels for Tuesday night into Wednesday of next week. Rockies: This is the place to be this weekend. The best snow in Colorado falls on Friday, Saturday, Sunday and even Monday. 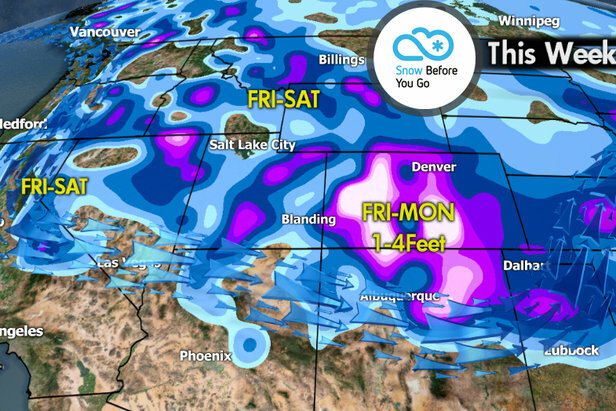 The Southern Mountains of Colorado will get the most and it looks heavy: 1-4 FEET! Resorts like Telluride, Silverton, Durango, Crested Butte, Monarch and Wolf Creek will get the most. My feeling is that Wolf Creek receives a storm total of up to four feet of snow by Monday afternoon. New Mexico ski areas such as Taos are in for a long-duration snow event from Friday through Monday. Look forward to heavy snow accumulations. The best snow in Montana, Wyoming and Idaho will fall on Friday and Saturday. Accumulations look to be light to moderate. The best bet is Jackson Hole on Saturday. In Utah, the best snow falls on Saturday and Sunday, but accumulations in the Wasatch are not overly impressive. California: Snow develops around Lake Tahoe on Friday evening and continues on Saturday, with light to moderate accumulations. The weather dries out on Sunday. Heavenly, Northstar and Sierra-at-Tahoe look like good bets. Northeast: The best snow falls on late Sunday into Monday at the ski resorts. Friday and Saturday look dry. Accumulations look light to moderate. Jay Peak, Killington, Okemo and Mount Snow all look good. Tomer's Take: Ski Wolf Creek on Friday, Telluride on Saturday and Durango on Sunday. Taos and Wolf Creek look outstanding for Monday.